Our 17-feet-long trailer held a compact bathroom complete with bathtub, TV, kitchenette with microwave, mini fridge and a cupboard full of board games. Except, it isn’t. A bumpy ride, I mean. Our driver Manjunath turns out to be a master driver and the almost four-hour journey is accomplished fairly smoothly. After the initial thrill of investigating our home for the next two days wears off, we settle into snoozing on our respective bunks, staring out of the window at passing scenery, reading the day’s newspapers, checking videos on Whatsapp. Our camper is a Jayco 184BH version which can sleep five people in bunk beds quite comfortably, preceded by a towing vehicle. The 17-feet-long trailer holds within it a compact bathroom complete with bathtub, a TV, a kitchenette with microwave, mini fridge and a stove hob. In the overhead cupboard are a stack of board games. And yes, there is radio as well as WiFi onboard. Manjunath’s real test comes when we get off the main road and onto a village track hedged by cornfields all around. Camper Trails has been in operation for a whole year now and has made many a trip out here but the sleek caravan still garners much curiosity and interest from the locals. The camper parks at the Karle Resort on the banks of the Hemavathi and we are immediately off. By the riverside, we sit and look at the gentle swell and roll of the waters, watch chittering birds perch for a long time on a canoe by the bank, listen to the far-off sounds of what seems to be traffic but turns out to be the river hitting and then winding its way through some big boulders. 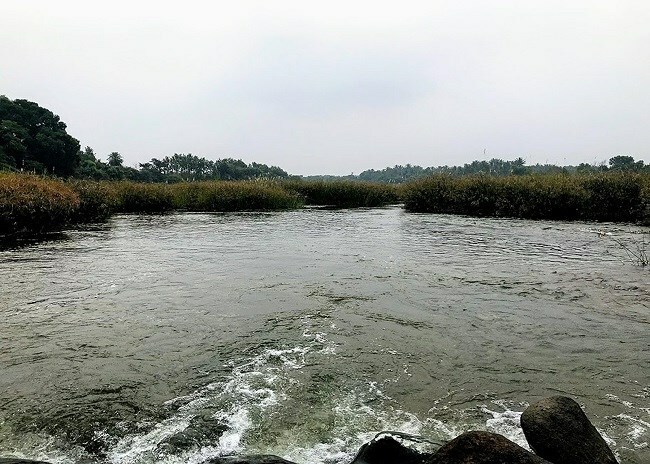 A popular river in Karnataka, Hemavathi is a tributary of the Cauvery. There is a masonry dam near the Gorur village which holds a reservoir of about 8,502 hectares. We are asked if we want to fish in the river, perhaps play a game of football, badminton or frisbee but all we want to do is to be lotus-eaters. For lunch, we walk to the common dining area of the resort and tuck into fresh veggies and some naatu kozhi, surrounded by a large, noisy group of tourists. We befriend the resort’s shaggy and amiable dogs - Ruby, the yellow Lab and Cruz, the German Shepherd, too. Every hour or so, we notice Cruz, who is female, going down to the waterside for a quick dip! 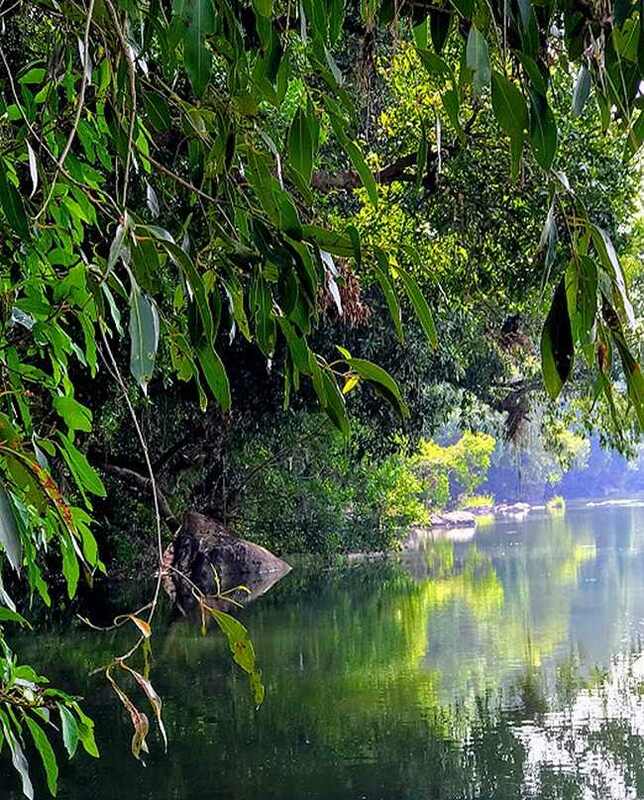 Sakleshpur is beautiful at this time of the year, a canopy of dense green forests, tea and coffee estates, swiftly flowing streams and a large variety of birdlife. There are trekking trails aplenty here but we feel too lazy to do much walking. A straw poll is held after lunch: to snooze or go sight-seeing? The latter option wins and we head 22 kms away to the simply marvellous Shettihalli Rosary Church, which, in this season, stands in full but forlorn glory. 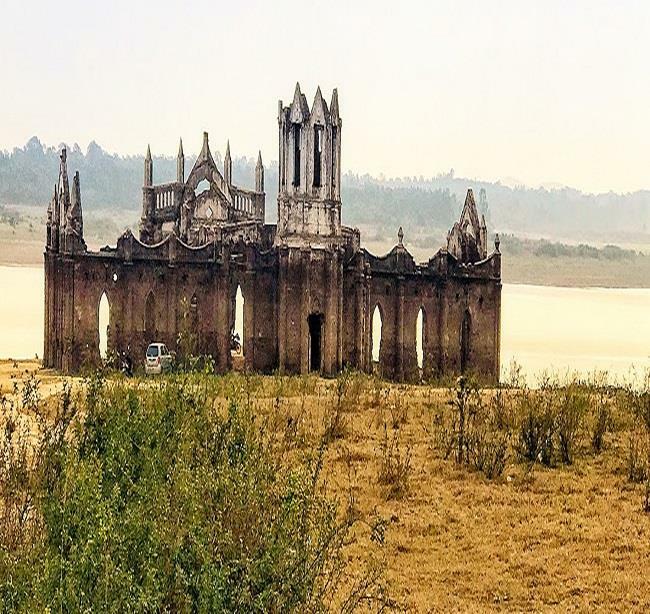 Built in the 1860s by French missionaries, the Gothic structure was hastily abandoned after the construction of the Hemavati Dam and Reservoir in 1960. Now people come in droves to see the partially submerged church during the monsoons. The skeleton of Shettihalli Rosary Church in the late evening light. We move on to the Manjarabad Fort, reaching just before closing time. The fort was raised by Tipu Sultan; at a height of 3,240 ft above sea level, and affords some stunning views of the Western Ghats. 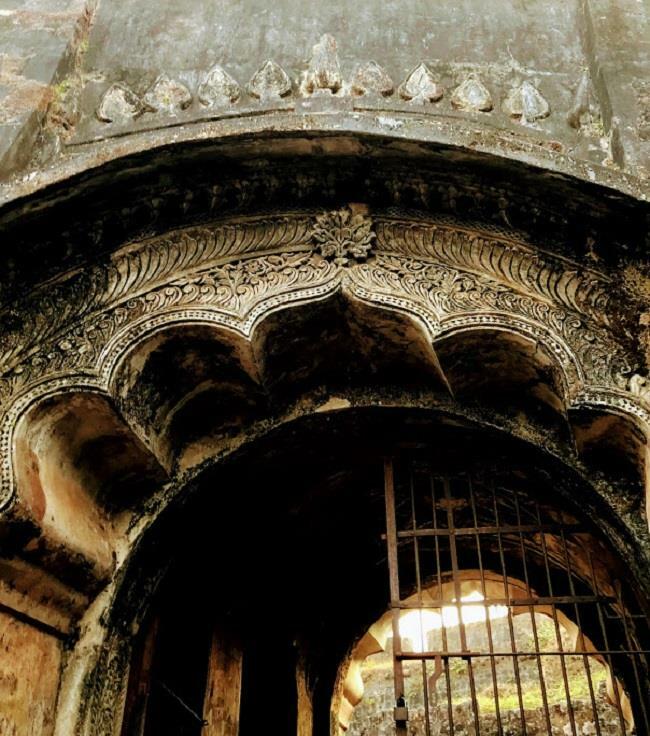 There are the usual topkhanas, stables, chambers, kitchens and a tunnel that, we are told, leads to Srirangapatna. Late in the evening, it’s a long drive back to the resort and the river, and dinner is had once again in the midst of the aforementioned tourists who are now setting up some impromptu entertainment involving song and dance. We hurriedly retire to the chairs set up outside our camper where Murthy, Manjunath’s assistant, kindles a soon blazing bonfire. We turn down the barbeque option and the sound of crickets on the river lull us into a comfortable sleep. Come day two and we are up early, opting to use the common bathrooms of the resort which are clean though basic. We are ready for our river walk by 7 am. This walk takes us through paddy fields where our guide shows us some peacock and peahens, and then some egrets! Then, we wander through fields stacked with threshed hay where Cruz makes merry scattering hay all around! And then we come to the river and straightaway, plunge in to thigh level. The current is anything but sluggish and we hold hands to ford the water. At one point, I feel the waters tugging at my feet and soon I see a familiar pretty blue rubber slipper - just one - floating swiftly away from me. There is no move to try and retrieve it by the less-than-alert guide, and I do the rest of the trek shod only on one foot. It is fairly easy in the river despite some large pebbles to be side-stepped gingerly, but tougher once I get onto the packed earth in the midst of arecanut plantations and head back to the resort. The Hemavathi in full spate took away my footwear! 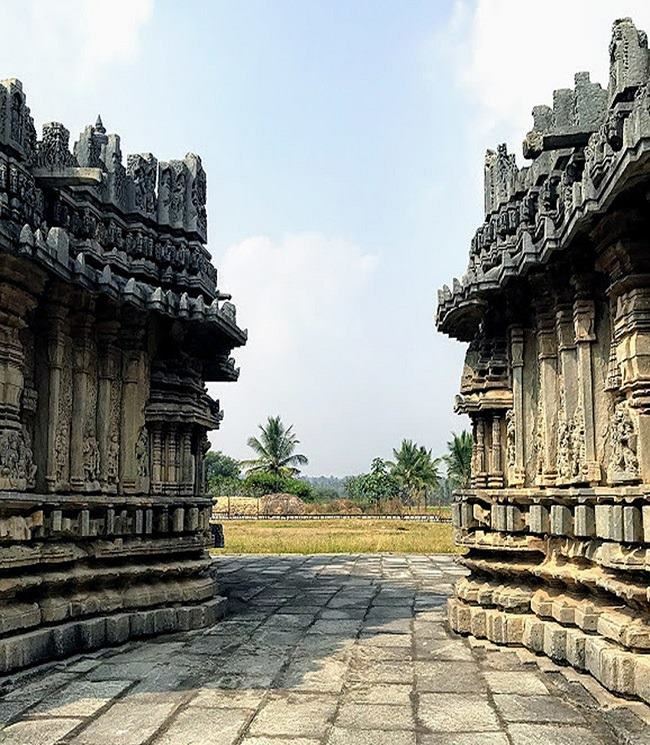 Breakfast over, we visit a roadside shrine, shining pristine white, and head back to Bengaluru with a quick stop at the lovely 12th century Nageshvara-Chennakeshava twin temples at Mosale village. Back in the camper, we go back to snoozing, reading the newspapers, checking Whatsapp videos and staring out of the window. The general consensus is that we have thoroughly enjoyed the trip, that the river was quite the highlight of our short holiday, and that our camper trailer was most comfortable. A decision is taken to do a longer trip soon, this time to some coastal resort. The Camper Trails staff spent the first part of 2018 doing trial runs to different destinations, to tie up with homestays or resorts in Coorg, Chikmagaluru, Sakleshpur, Magaluru, Mysuru/Bandipur, Masinagudi, Kannur and Goa. Now they do four to five trips a month, hosting families with kids, couples, all-women groups. On the anvil are wine tours and self-drive caravans in the second half of 2019. The focus will stay on the southern states of Karnataka, Kerala, Goa and Tamil Nadu, with plans to open up new destinations like Puducherry, as well as a Heritage Trail covering Madurai, Rameshwaram and Kanyakumari. Camper Trails charge Rs. 12,000 for a group of five persons for one night-two days on weekdays; Rs. 15,000 for a group of five persons for one night-two days on weekends. This is excluding fuel and food, those expenses are borne by the travellers. CT factors in the driver and attender batta, toll fees both ways and see to fridge stock for day one.